The most celebrated novelist of all time retells "the greatest story ever told," integrating the four Gospels into a single twelve-chapter narrative of the life of Jesus. 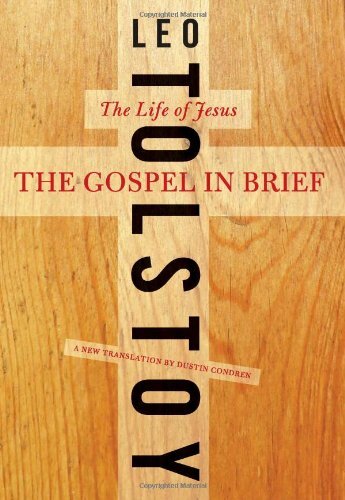 Based on his study of early Christian texts, Leo Tolstoy's remarkable The Gospel in Brief-virtually unknown to English readers until this landmark new translation by Dustin Condren-makes accessible the powerful, mystical truth of Jesus's spiritual teaching, stripped of artificial church doctrine. "If you are not acquainted with The Gospel in Brief," wrote the philosopher Ludwig Wittgenstein, whose life was profoundly influenced by it, "then you cannot imagine what an effect it can have upon a person." traveled extensively abroad, and married Sophia Bers. The couple were happy for a long time, with Countess Tolstoy participating actively in her husband's literary and other endeavors. The center of Tolstoy's life became family, which he celebrated in the final section of War and Peace (1869). In this great novel, he unfolded the stories of several families in Russia during the Napoleonic period and explored the nature of historical causation and of freedom and necessity. A different note emerged in Anna Karenina (1876). Here, too, Tolstoy focused on families but this time emphasized an individual's conflict with society's norms. A period of inner crisis, depression, and thoughts of suicide culminated in Tolstoy's 1879 conversion to a rationalistic form of Christianity in which moral behavior was supremely important. Confession (1882) describes this profound transition. Tolstoy now began to proselytize his new-found faith through fiction, essays, and personal contacts. Between 1880 and 1883, he wrote three major works on religion. A supreme polemicist, he participated in debates on a large number of political and social issues, generally at odds with the government. His advocacy of nonresistance to evil attracted many followers and later had a profound influence on Mahatma Gandhi and, through him, Martin Luther King, Jr. (see Vol. 4). Tolstoy's stature as a writer and public figure was enormous both within Russia and abroad, greater than that of any other Russian writer. When the Orthodox Church excommunicated him in 1901, a cartoon depicted him as disproportionately larger than his ecclesiastical judges. Tolstoy's final years were filled with inner torment: Living as he did on a luxurious estate, he felt himself to be a betrayer of his own teachings. He also suffered from disputes with his wife over the disposition of his property, which she wished to safeguard for their children. In 1910, desperately unhappy, the aged writer left his home at Yasnaya Polyana. He did not get far; he caught pneumonia and died of heart failure at a railway station, an event that was headline news throughout the world. In the course of Tolstoy's career, his art evolved significantly, but it possessed a certain underlying unity. From the beginning, he concentrated on the inner life of human beings, though the manner of his analysis changed. The body of his writing is enormous, encompassing both fiction and a vast amount of theoretical and polemical material. Besides his three great novels---War and Peace, Anna Karenina, and Resurrection (1899)---he wrote many superb shorter works. Among these, The Death of Ivan Ilyich (1886) stands out as a literary masterpiece and fine philosophical text, while the short novel Hadji Murat (1904), set in the Caucasus and Russia during the reign of Nicholas I, is a gem of narration and plot construction. Tolstoy has been translated extensively. The Louise and Aylmer Maude and Constance Garnett translations are institutions (for many works, the only versions available) and are used by different publishers, sometimes in modernized versions. New translations by Rosemary Edmonds, David Magarshack, and Ann Dunigan are also justifiably popular.